By far one of the biggest, and most fulfilling, projects the Civic Fellows do each year is CSO Connect. 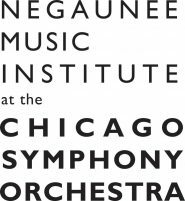 This is a far-reaching program that brings together the Chicago Symphony Orchestra, its partner schools, and the Civic Fellows under the umbrella of a single curriculum, which we’ve written a lot about it in the past. This year we have been working hard on creating our presentation of memorized music, choreography, teaching, and even a little acting. During the past few weeks we finalized all of the details and had the opportunity to test it out for the students of the Rice Family Center in Evanston. Thanks to the hard work of viola fellow Roslyn Green, Civic has forged a new relationship with the Rice Center, and we were excited to bring our presentation outside of the city. The students there were wonderful, honest, and very engaged. Towards the end of our presentation, bassoon fellow Midori Samson led the students through a collaborative composition exercise where they displayed a great understanding of music – including identifying the different colors that each instrument’s sound most resembled. We hope to go back soon to work with these bright kids again. The beginning of the Connect season was not, however, the only major project happening at the end of February. In the final week of the month, we began rehearsals for a Civic Orchestra concert to be led by legendary conductor Christoph Eschenbach. We started off with prep rehearsals led by Erina Yashima, the CSO’s Solti Conducting Apprentice, whom the orchestra has worked extensively with over the past year and a half. She set right to work ensuring we were well prepared for Eschenbach’s arrival. This was quite welcome, as the program he picked was enormous: Wagner’s Tannhäuser Overture, Schoenberg’s Chamber Symphony No. 1, and Brahms’ Symphony No. 2. Each is a masterwork in the orchestral canon, so the chance to work on them with one of the most famous living conductors was something all had been looking forward to. Once Eschenbach arrived, he immediately began shaping the music, using a vast knowledge of the orchestra to bring out different colors and textures. He also brought a great amount of positive energy to rehearsals, which was reflected in the energy the orchestra brought to the music. The concert will always be one of my favorites. During the week we spent preparing for the concert, we also invited some young musicians from local community music programs to Symphony Center for a morning of music-making to kick-off the 2018 Chicago Youth in Music Festival. We started off (at ten o’clock in the morning, no less!) performing the last movement of Brahms’ Symphony No. 2, led by Erina Yashima, for the students before breaking off into instrument specific sectionals. Leading the clarinet sectional along with my Civic colleague Cally Laughlin, and our surprise guest Civic alum Joe Sanchez, I was impressed with the level of preparation the students brought to the lesson. After sectionals, the 140 member orchestra reconvened on stage for an hour long side by side rehearsal on their prepared music, led once again by Erina Yashima. Erina did a wonderful job of working with these talented young musicians, and we ended with a side by side performance for their families and teachers. A lunch of pizza and salad capped off the Saturday morning, and we said goodbye to the students before returning to the hall for a rehearsal of our own.